For someone who has lived through the .com bubble the madness currently unfolding in the crypto space is just plain breathtaking. It is quite awe inspiring to see people make the exact same mistakes they made 17 years ago. Of course, today’s investors are likely different people who, for the most part, have not lived through the .com bubble. Those of you who are looking to read more about the topic or learn some basics about cryptoassets can check the end of this blog post, where I am simply collecting some interesting links that I believe are worth a look. a) Cryptocurrencies := Cryptoassets that are mainly used to store value, speculate or transact on the blockchain. Examples are Bitcoin, Litecoin and Dash as well as ZCash. c) Security token := any and all ICOs that are sold to investors so that they can speculate on the progress of a start up. This would include TenX, Monaco, Status and Iconomi amongst a host of others. In the late nineties and early 2000s there was an IPO (initial public offering) boom. The Nasdaq was driving new highs every day and new public companies would list there or on any of the “New” or “Tech” market segments established by other stock exchanges. If you took part in the bookbuilding process and bid for stock during the IPO, you were often able to double your money on day one of trading. Everyone was taking part — institutions, high net worth investors and your local retail guy who worked at Walmart or drove a cab. As a matter of fact cab drivers handed out tips of the next hot IPO to their riders. Most IPOs only needed a business idea that was vaguely related to the internet to achieve success. Today this is very much the same story in ICO world. It appears everyone has taken part in an ICO or a pre-sale of some random token that promises to use the blockchain to deliver your local groceries or some other ridiculous idea that could potentially benefit from a Dapp but certainly does not need a token to work. Some of these ICOs, especially in early 2017 have indeed 10x the money of people who invested, which has fueled the boom. Note that the list of non-scam ICOs (looking at you, Veritaseum and not because you are legit…) that have actually done well for their buyers in Bitcoin terms (not in US Dollar terms) is quite short. The one difference today is that the token, most of which are using the Ethereum blockchain to trade, have absolutely no ownership rights. But that is a point I will come to later. For now, let’s just remember that the ICO mania mirrors the IPO mania nearly two decades ago. In the .com bubble existing technology firms listed on the Nasdaq sometimes decided to add “.com” to their company name and saw their shares surge, sometimes 30–50%. Well, guess what is happening now… There have already been a handful of companies that simply added “Blockchain” to their company name. Note that this is just a name change in many cases… And of course their value has soared just because of that. During the .com bubble, the major problem for analysts and investors was that most of the companies had losses and not profits, so there was hardly anything to value them on. Traditionally, things like Free Cash Flow yield, EV/EBITDA and P/E multiples or DCF analysis are being used to value equities. The problem with all these methods is that if profits are forecast to be negative for a substantial period of time or very tiny in relation to market cap, the ratios do not make sense and DCF will rely mostly on the “terminal value”, which is an assumed value in perpetuity based on profits 10 or 20 years out. As none of these methods made sense (not because they did not work, but because the shares traded at ridiculous levels), analysts thought up new methods to value internet stocks. This went so far that the oft-read standard volume “Valuation” added an entire chapter on the valuation of internet stocks that was later taken out again as it was obvious bogus. Fast forward to today — the same is happening again. While I want to be clear that there are important differences in that Bitcoin does have some sort of a value as a “store of value”, people making up new ideas like network value for token (not so much for Bitcoin) just makes no sense. Analysts and investors alike are ignoring valuation methods and seem to be fine with projects that offer nothing in return to carry “kick starter” valuations of 100m USD+. While there are obviously worrying parallels between the two bubbles, there are even more worrying differences. While during the .com bubble at least people were receiving actual equity for their hard-earned cash, when they invest in most ICOs (the ones of the security token type above) they receive no rights in return. Let me stress this: they receive NADA, ZILCH, NOTHING of any value. They are invested in hot air. This is especially true for those ICOs that offer a product or service that does not really need a token. Let that sink in for a minute: because someone said “blockchain” you have bought hot air off a person that you do not know in the hope that someone else will buy it from you for a higher price. The only thing that helps you is the “greater fool theory” (if you do not know what that is, it is probably you). I have written about this before. Market cap is defined as the value of all (ALL) shares outstanding in equities. However, if you look at coinmarketcap.com, the “go-to” site for crypto market caps, you will notice that they only count the “Circulating Supply”, which is generally the amount of coins NOT held by team members of the firms that are selling them. In other words, they are showing only “free float” market cap if you were to compare it to equities. Think about it — when you say Project XYZ is “only” worth 100m USD on coinmarket cap, it should be at least 200m (which is already crazy), you are probably ignoring about 50% of the token held by the founders of the project. These can be sold too… So not only are the valuations of 100m USD and more for hot air, these are not even the full story. In equity markets, of course there are occasional scams and there were IPOs that turned out to be founded on not much more than a pyramid scheme. However, looking at crypto ICOs, the sheer amount of obvious scams is breathtaking. Projects such as Veritaseum, Monkey Capital or WCX all reek of pyramid schemes, scammers and unprofessional conduct. While WCX still has a chance to turn out differently (as the ICO is not over yet, but things look quite spooky with no team members public and the nominated escrow for the money confirming that he holds no coins in escrow), the other two by now are confirmed scams (as for VERI, check the links below, as for Monkey do the same). This is truly terrible as it combines the worst of no regulation, internet anonymity and greed. Update: I think it is fair to say the people behind WCX are confirmed scammers. Read this. While the .com bubble had its fair share of retail investors, the main driver were the institutions. 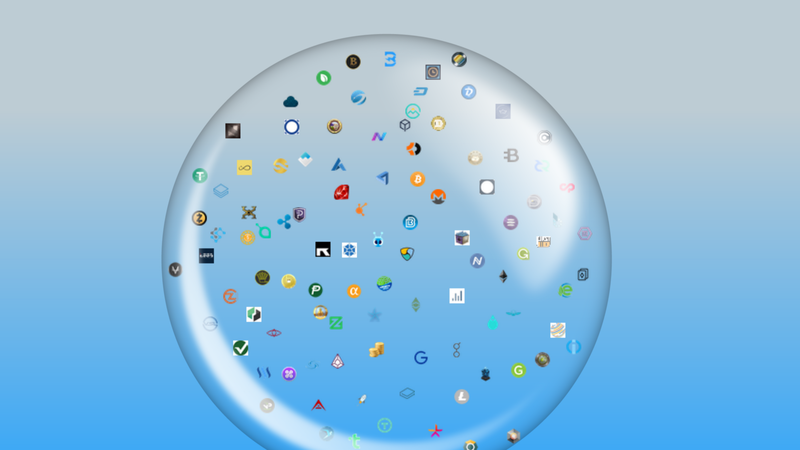 In the crypto bubble, the field is made up almost exclusively of newcomer retail investors that probably have never held a stock in their life. This is the reason why things like technical analysis work much better in crypto than in equities, because these markets are quite obviously more likely to be driven by fear and greed than established markets. TA is only a way to structure analysis of fear and greed after all. What I am really getting at here though is that most of these people have no experience whatsoever with losing money in investments. When the bubble bursts all of them will be headed for the exit at the same exact time. Furthermore they lack the skills of recognizing that we are in a bubble and that they are invested in hot air. If anything like that is suggested in any of the numerous slack or telegram channels of any of the hot air projects, whoever posted it directly gets blocked in the channel or showered with “this is FUD” accusations (fear uncertainty doubt, a crypto acronym that is supposed to say “this is just fearmongering, if you just hold your investments you will do great”). a) as long as token are not clearly classified as securities wash trading, insider trading, spoofing and literally any kind of negative market conduct is not specifically outlawed. It might be seen as legal by the people who engage in it and of course it is extremely easy to do for those involved in a project or having gained a following in social media. b) most token actually fit the definition of a security by the SEC. Note that to be a security, a token needs to EITHER offer security-like rights (dividends, share of profit, voting rights) OR be offered to people who buy it in the expectation to sell it for a higher price later. Practically, if the token gets listed on an exchange and that is part of the ICO promise then it is a security. Most people do not want to understand that the second part of this definition currently covers ALL (all…) ICOs. Rightly, securities need to follow certain regulations before they can be sold and investors need to be educated. c) the Cryptoworld seems to think it is immune to regulation in the future. This is a mistake. The moment a government like the US or the EU attaches a prison sentence to trading securities that are not properly following regulations (hint), to selling these securities or even owning them, watch law abiding citizens flee crypto. Of course Bitcoin won’t disappear, but it also won’t be trading at 6000 USD or more… Instead crypto should welcome regulation. It solves a lot of problems, ethical and otherwise. Note also that currently the biggest exchanges are actually located in the US with people who have addresses and lives running them. These are not immune to regulation. So what will happen in my view? I believe that there is currently a massive bubble going on in the space of “security token” defined above. This bubble somewhat extends to “utility token” and “cryptocurrencies” as well, but it is clearly home in the ICO space. In the aftermath of this ICO carnage, I would expect the same story as with the internet firms from 2001. Really good projects will give their token holders equity-like rights and fulfill securities regulations. New ICOs will be strong companies that will have a good value proposition and again, will actually be selling something valuable and not just hot air. When this ICO 2.0 phase starts, platforms such as Ethereum will also strongly recover. Just like it happened with the .com firms, I expect this wash out to be a positive medium term effect and to unlock a lot of value. There is not a doubt in my mind that the blockchain (and with it networks like Ethereum and currencies like Bitcoin) will to a large extent replace current market infrastructure and even actors (like banks and clearing houses or stock exchanges). But the wash out will need to happen before that and it will happen. It is not a question of IF, but WHEN. I would therefore personally not invest into any random ICOs at all nor their respective token at this late stage in the game. The likelihood you can buy all of these cheaper at some point over the next 12 months is extremely high. Again, this is not to say that the blockchain is not the future and it is not even a case against Bitcoin (I would claim it is probably a case for it) or Ethereum. But I do hope this serves as a small wake up call to everyone getting delusional about the potential riches of the crypto world at this precise point in time. The Crypto-Awakening — or: what happens after the crash? Finally a short but important disclaimer: none of what I write here is to be construed as advice to buy or sell any kind of asset. It is merely my personal and not professional opinion. Any asset can go to zero and I am not providing Financial advice.